It was last October when there were reports that the Oppo Find 9 will be launched sometime in 2016. Then, back in April this year, there were rumors that the device will be made official in the month of June. It’s September now, and we’re still waiting for the phone. And looks like the wait isn’t going to end anytime soon as a new rumor is suggesting that the handset won’t hit the market this year. 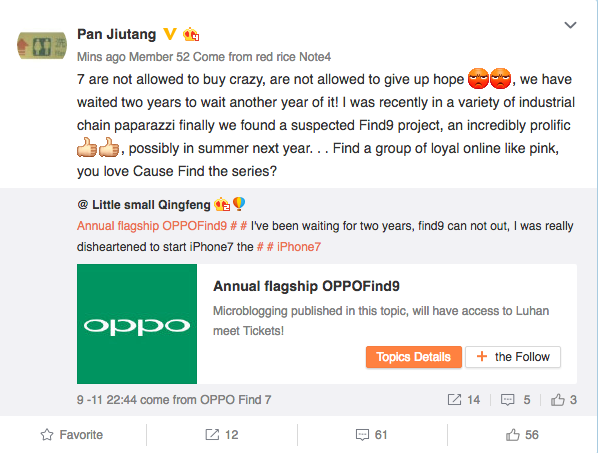 According to well known analyst Pan Jiutang, the Oppo Find 9 is still under development and could possibly be launched sometime next summer. Specs-wise, previous rumors have suggested that the handset will be powered by Snapdragon 821 SoC and sport a 5.5-inch QHD display. It’ll have 6 or 8GB RAM, while internal memory will be 128GB. The camera department will be handled by a 21MP rear unit (dual-camera setup) and a 16MP front shooter, while a large 4,100mAh battery (with Super VOOC fast charting) will be there to keep the lights on.